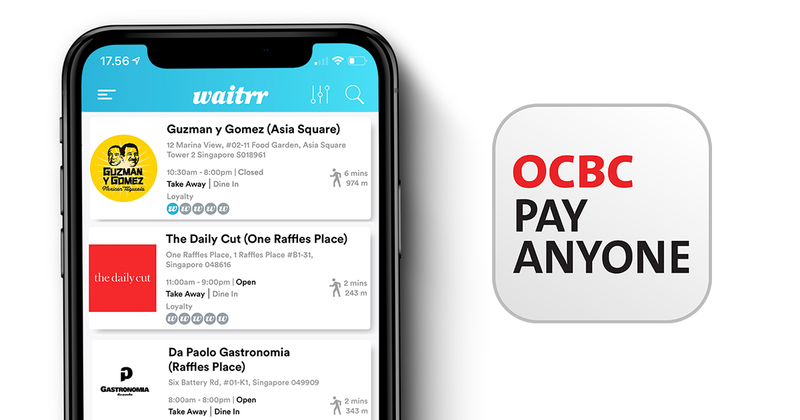 Waitrr, a mobile ordering and payment solution in Singapore, has just enabled OCBC Pay Anyone on its platform, to make dining even more seamless. Since it was started up by Tim Wekezer and Andras Bokros in 2017, Waitrr has helped restaurant patrons avoid long waits for service staff to take their orders and handle their payments, as everything can be settled in the app. In a simple process, customers browse the restaurant’s menu through Waitrr, then order and pay in-app as well. It also works for takeaway, by letting customers place their orders from wherever they are and select a suitable time to pick up their food at the store. When we spoke with the founders in 2017, they’d had 25 F&B partners on board back then. Now, Waitrr counts over 100 venues, and has been “growing at a rate of 25% month on month”. The Daily Cut, Guzman y Gomez, PAUL and Da Paolo Gastronomia are some of the F&B outlets they currently work with. With OCBC Pay Anyone as an added option, users can choose it as their preferred payment method after placing their orders in the Waitrr app. This will automatically launch the OCBC Pay Anyone app, with the merchant’s name and payment amount already pre-filled—so all that customers need to do is review the details and tap ‘pay’. Until 18 May 2019, qualifying OCBC customers can enjoy a $3 discount on orders above $6 in Waitrr, by paying with OCBC Pay Anyone and using the promo code “OCBC”. The promotion will be limited to 5,000 redemptions per month. “We are excited that OCBC customers now have a faster way to order and pay for their daily meals,” said OCBC Head of Digital Payments, Milind Sanghavi. He also says the partnership is “another example of how OCBC supports the Food & Beverage industry here in Singapore”, while Waitrr’s Wekezer believes there is “a natural fit” between the two payments solution services in helping customers save time when dining.